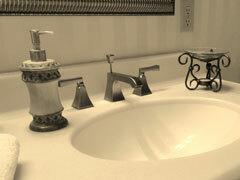 If you have a plumbing problem in your home, call us at (920) 773-2443 for fast, professional service. There’s a long list of things that can go wrong in any home or office—clogged toilets, cracked or leaking sinks or pipes, water heaters leaving you with cold water, septic problems, and low water pressure. We’ve seen just about everything and know how to fix it all! If you’re building a new home or office building, remodeling a kitchen or bath, or just installing a new sink or disposal, we can handle of all your plumbing needs. We take pride in staying on schedule and on budget. Ask us for references from the homeowners, builders and general contractors we have served over the last 70 years. Solar hot water systems are a proven technology that can reduce your utility costs and your energy consumption. Without compromising any convenience, you can enjoy water heated to the same temperature as that provided with a conventional system but at a fraction of the cost. Adding a tankless hot water system ensures you’ll have a “green” hot water system year round and an investment that pays for itself in a few years. Learn more. Some types of piping can cause ongoing maintenance problems or low water pressure and actually lower the value of your home at resale. In these cases, repiping is often the best option. We’re able to handle whole-house repiping and have become experts at doing these projects with as little disturbance to the home as possible. Saving water is good for the environment and can significantly reduce your home or business utility bills. We sell and service high quality high efficiency toilets, the latest shower heads and water taps as well as offer complete plumbing system reviews to detect and eliminate water leaks. You don’t need to sacrifice comfort or reliability to save water. Contact us to learn more about environmentally responsible steps you can take to update your plumbing system.